WKDU, Drexel University's radio station, has a slew of great shows to tune into if you're looking to hear all that the expansive, overflowing Philly music scene has to offer. 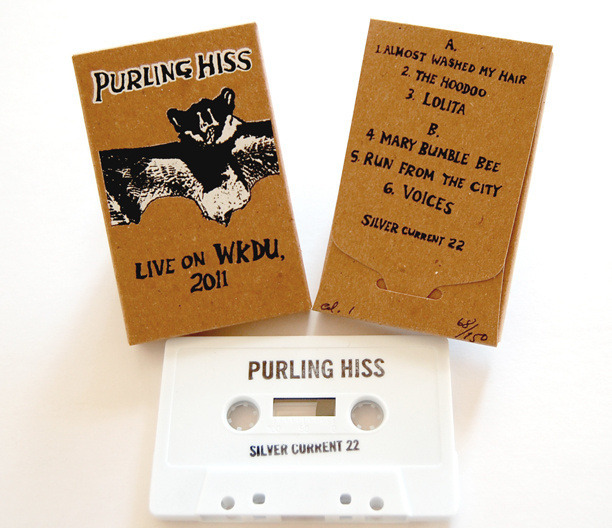 On the now defunct Mike Bell Show (the very same Mike Bell of MB and The Movies) in 2011, Purling Hiss streamed a full live set helmed by a band of merry brothers. Engineered by Kyle Pulley of Headroom Studios, curated by Jeremy Gecker of currently-on-hiatus garage band Band Name, and recorded at Big Mama's Warehouse (home to current Philly staples Amanda X, Dogs On Acid, The Weaks, ex-Algernon Cadwallader, etc. ), the session is now available to stream, download, and pick up in super limited edition format through Silver Current Records. The handmade tapes and CD-Rs feature the full, excellent set and some pretty rad art. You can stream the whole thing below, then head here for a 300 CD-R run and 150 cassette run. Purling Hiss is heading out on tour with The Men in two weeks, dates for which are below.